Super-listening is one the many superpowers I’ve been expected to develop as a parent of autistic kids. Whenever they get a new craze, invest twenty minutes to read a wiki on it this means that you can bring in a little bit of reciprocal conversation on the topic they’re interested in, to model good conversation skills. Also means that you can quickly come up with plausible answers to pop quiz questions, even if you tuned out. Mirror their reactions. Laugh when they do even if you lost track of the joke. Look concerned when they look concerned. It’s about nurturing joint attention and emotional connection – rather than the facts. Give them thirty minutes to talk about their thing, and then insert the question you really want the answer to. For example “why were you upset after school yesterday”. The pay off for an hour of listening to Pokemon is that once they’re talking about one thing, they’ll be on a talking roll sometimes. Take them with you when you have driving errands primetalkingtime without eating into your free time. Enjoy the fact that they want to bring you into their world. It’s a compliment. And it’s setting up the idea that you care about their ‘stuff’. Here are the photos that didn’t show up in the last post for some reason! 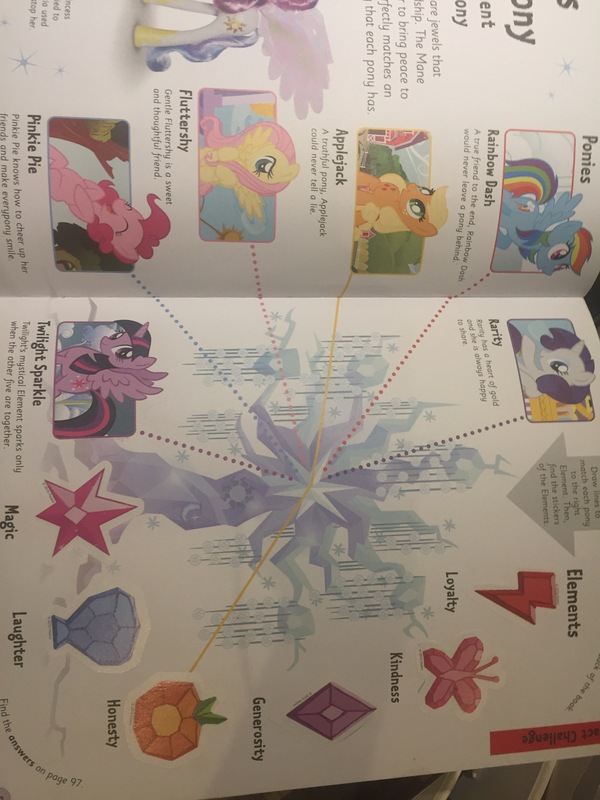 Squid’s Dad found this excellent little activity book – which had a helpful page with each pony’s special friendship skills. She doesn’t know any of those words – but she knows all those ponies – so it was a nice hook to chat about what makes a good friend. The great thing about doing ‘social skills’ through the ponies is that it is one step removed. There is no personal judgement of her or her behaviour – she can be the external observer with a birds-eye unemotive view of the ponies. And I’m hoping the theoretical lessons will translate into practical friendship skills. And the darn blighters are so cute it was a nice rainy-day activity in any case. One of my big worries with the speech delay was how it would affect Junior’s social interactions. Two year olds are quite forgiving, three year olds less so; by four and five the single arched eyebrow of disdain starts to be observed. Junior’s speech might be coming on leaps and bounds – but farmyard animals and knowing your colours don’t count for so much when you’re trying to make a friend (or not alienate ones you’ve already got). This was a project from when she was three and in nursery. At that stage she was linking words towards three/four word sentences. Very weak on verbs, grammar and the little linking words – but a great mimic. We made a crib list of a handful of sentences that we felt would most help her social interactions and drilled her to fix them like incantations. From memory, the key ones were “do you want to play?” and “my turn next” / “your turn”. These supported her main social difficulties at that time: initiating a friendship appropriately and participating in a shared game without inevitably either taking over or withdrawing. Junior is 4 now, and I’ve gone back to coaching some ‘magic phrases’ at a higher level. She’s a terrible loser (and not a great winner). I can see this being a social handicap. She’ll win and run around crowing her victory; lose and crumple and stamp around. Now I’m coaching her to squeeze out a ‘good game’ handshake. And actually – when she congratulates her opponent – it takes the energy out of her losers-rage – because she recognises the games as the social dances they are, not as measures of her worth and success. Think back to when you learned a language. Lots of vocabulary, grammar. Cringingly bad voice acting of teenagers on crackly recordings discussing how they plan to go to ‘le boum’ on the ‘fin de semaine’. Then you grow up, get a job, and get casually told that you’re flying out the following week to a critically important conference abroad. Only thing to do under that kind of pressure is to dump the ‘learning’ and start the ‘cramming’ – cutting away everything other than the most useful phrases. ‘Bonjour’; ‘Ou est TOILET’; ‘Je suis VEGETARIAN. Non poison VEGETARIAN. POISSSSON NON.’; ‘Trop cher. Je-ne-pas MONNAY.’. It’s patent hacked together nonsense – but it gives you enough to demonstrate willing to your hosts. Leverage﻿ enough social charm that someone might invite you to ‘le disco cette weekend?’. I don’t know why my baby didn’t speak. I do know that I didn’t keep her in a cupboard under the stairs – and so my working assumption is that it’s quite possible there are other factors ‘mixed’ in, which have led to her being slower to talk. So, while she’s too small to screen for autism, and probably wouldn’t be ‘autistic enough’ to attract any real help in any case… but I think it doesn’t harm to keep that in mind as a possibility. These cupcakes are part of that. I wanted to work on words for emotions, but also on recognising emotions. These cupcakes look quite glum – but most of them were happy! The faces are very easy – chocolate balls for eyes and mouths pressed with the edge of a cookie cutter. However – this activity has a high tantrum potential…. although they look a mess, the ones in the picture were largely made my an adult – and the activity ended up being the talking while eating the cakes. Good enough … yuh?